The Hotel Burleigh, which has been conducted by Lyman W. Stevens for several years, on Monday of the week changed owners, the new proprietors being Harry and Joseph Mishou of Old Town. Hotel — The Hotel Burleigh, which has been conducted by Lyman W. Stevens for several years, on Monday of the week changed owners, the new proprietors being Harry and Joseph Mishou of Old Town. Coming through — The Mars Hill News reports that an automobile came through from Houlton to that town Tuesday of last week. Assumed position — W.E. Cobb, formerly proprietor of the Vaughan House in this town, assumed the management of the Hotel Braeburn in Guilford last week. New truck — Chief Elray DeMerchant of the Caribou Fire Department said yesterday that a new American La-France quadruple fire truck had been ordered by a committee of councilmen and members of the fire department. The new all-purpose truck was ordered last Monday, April 10, and delivery is expected about the middle of August. Barrel grapple — T. Milton Lufkin, formerly of Caribou, has been awarded a certificate of merit at the New England Ship Yard for designing a new double action barrel grapple, which is now used in the yard. 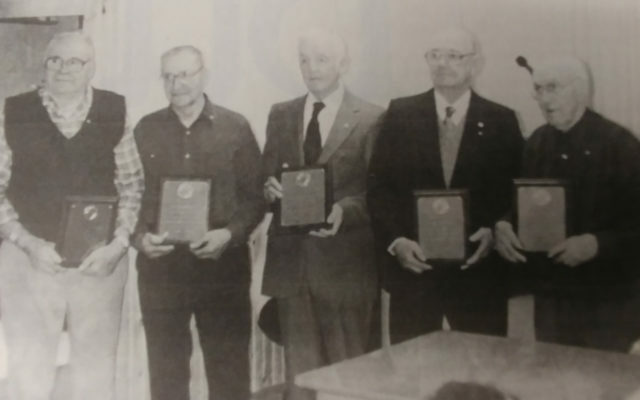 One of the first to graduate from Caribou High School, Mr. Lufkin formerly wrote a popular column, “Who Remembers,” for the Aroostook Republican for approximately a year. Stolen car, again — A car taken from the Cary Memorial Hospital parking lot by two 15-year-old juveniles at about 3 p.m. Sunday afternoon was recovered 17 hours later at 9 p.m. Monday evening in Petersburg, Va. The Keith Harmons, owners of the 1966 sedan, said Tuesday that they had been informed that the two youths had given themselves up to police in that community. Mrs. Harmon said they ran out of money, got hungry and were tired, she was told. Mrs. Harmon, who is employed at Cary Memorial, had left the keys in the parking lot. The Harmons did the same thing about 25 years ago and had a similar experience. While Mr. Harmon visited Mrs. Harmon in the hospital, where she had given birth to a son, their car was taken from the hospital and was found, unharmed, three days later in New Sweden. Bicycle licenses — Bicycle licenses are now available at the Caribou Police Station, local authorities advise. According to city ordinance, all bicycles must be registered by the month of May. Registration is required for identification purposes only, police said, adding that the information recorded is helpful in restoring lost or stolen cycles to their owners. Plan unveiled — Jefferson Cary Foundation members April 6 unveiled plans for a $250,000 expansion of Cary Medical Center’s cancer and specialty clinics in a project designed to offer a larger operating space for physicians and nurses and more privacy for patients. The expansion will more than double the existing facility, said Scott Solman, a member of the foundation board of directors and the co-chairman of the project’s corporate fundraising effort. New price — The price of the Aroostook Republican and News sold at stores and newsstands will be 60 cents per copy starting with the issue of May 4. There will be no increase in the cost of home delivery, either by carrier or mail. Announcement of the first increase since July 1988 in the price of the newspaper was made by John P. Bishop, publisher. “The company has held the price of the newspaper to 50 cents per copy for almost six years, but increasing costs of production and distribution have forced us to set the new price, “ Bishop said.